When I was a very young knitter both in age and experience, I knit my first sweater and wore it to an event called Rhinebeck where I was introduced to a rather famous knitter. Since the knitter is still living and still famous I will avoid naming the individual. The person doing the introduction was crowing about how well my first knitted sweater turned out. The famous knitter looked at the cardigan then pulled it off me and scrutinized the inside of the sweater. She said that the hallmark of good knitting was a very neat wrong side where the ends of the yarn are woven in so they cannot be seen. While most of my ends met her approval, some did not. She took the time to demonstrate how these should be handled. She did this by undoing them and then weaving them back together again. While I am grateful for her sharing her talent, I was traumatized by the whole thing. I didn’t knit another thing for five years and when I did, I dreaded the moment of weaving in the ends. I still do. Shawls produce the ultimate dread regarding weaving in ends so they can’t be seen. After all, the wrong side of a shawl is easily visible and I’d rather you see my underwear than die of embarrassment from an improperly woven in end. So here is what I’ve learned since that first fateful trip to Rhinebeck. 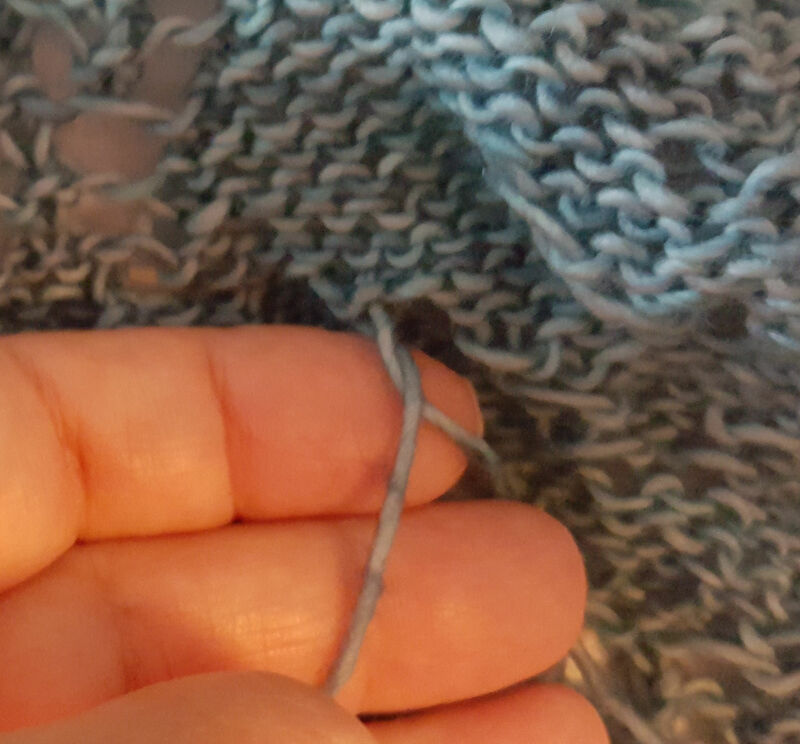 With a sweater, yarn ends can be hidden in seams. Not so with a shawl. 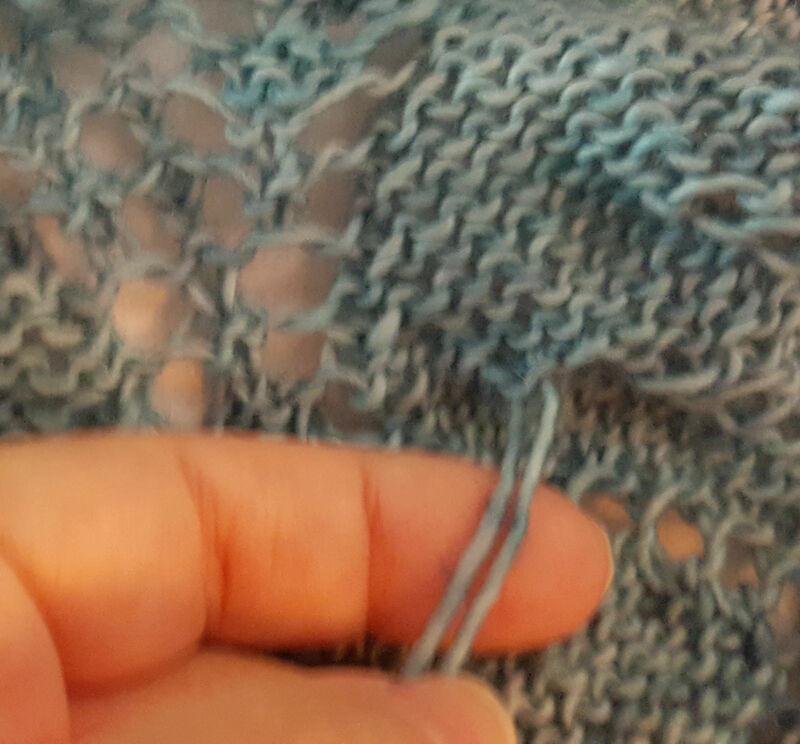 Often the edges of a shawl are patterned in lace which doesn’t make a great place to hide yarn ends. Unlike with a sweater, where the rule is join in new yarn at the edges where it will be lost in the seam, this doesn’t happen with a shawl. Sometimes I need to join new yarn while in the middle of a row. 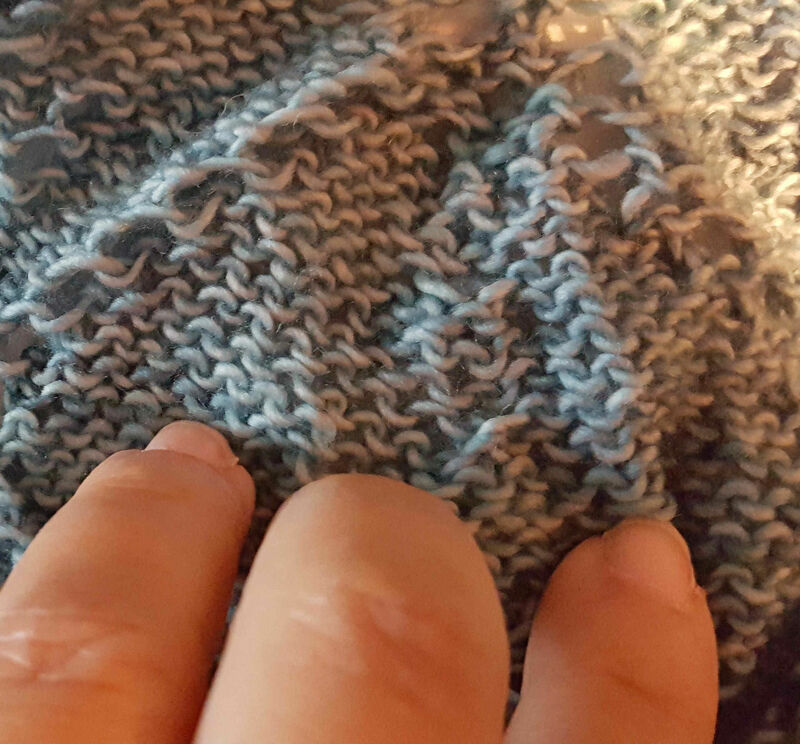 It is best to pick a point where there is a block of stockinette stitch surrounding the join. I keep my joins simple. The more simple, the less noticeable. I join new yarn by wrapping the new and old yarn around the needle and knit the stitch. 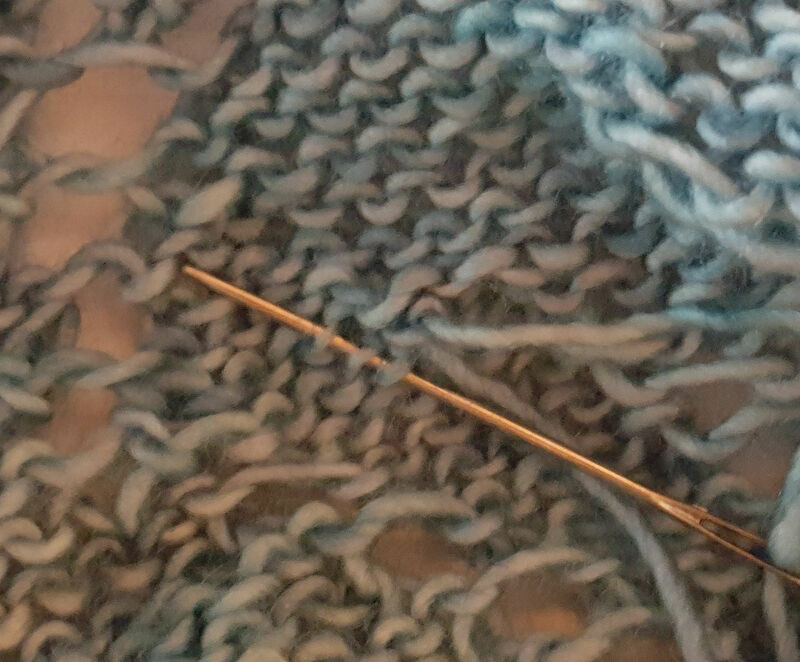 This creates two stitches, which I mark so I remember to decrease it on the wrong side row. Below is an example of where I joined yarn in mid row. This kind of join has never unraveled for me. In fact the garment will wear out before the join gives way. It is, for me, the surest way to join yarn. When it comes time to weave in the ends of the yarn, I want to prevent a hole. I do that by crossing the yarns. Then when weaving in I weave yarn A one way and yarn B in the opposite direction. By weaving in, I mean that I am piercing the yarn of the purl stitches and drawing the yarn end through them. I pierce three going down one row and then pierce three going up the next row. It is like duplicate purl stitching except that I am piercing the yarn and drawing the yarn end through in order to have it hold. If I just duplicate stitched, the end of the yarn would always be exposed as the garment is used. By piercing I am burying the yarn end. 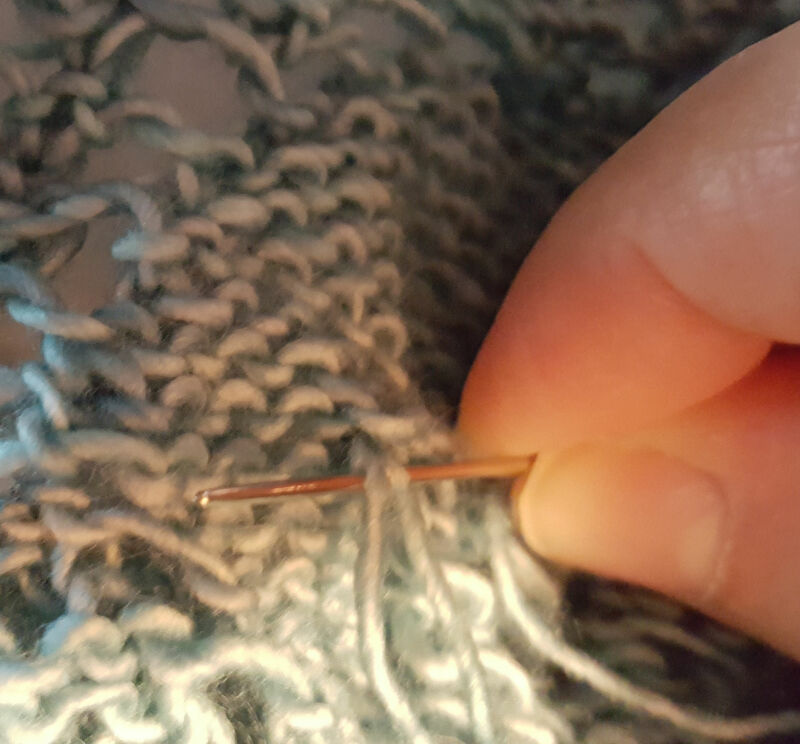 In order to “lock” my weaving I select a purl stitch, pass the needle and yarn end underneath without piercing, draw yarn end up and pierce it as close to the purl stitch as I can get so it locks into itself. I hope this helps some. My way is not the only way. There are many techniques for weaving in yarn ends. Give them all a try and find which one works best for you. Feedback that helps you learn is great. Feedback that traumatises you, not so much. It rather depends on how it’s delivered, don’t you think? Maybe a better way is to ask the person if they’d like some tips. Thanks for sharing yours. Thank you for those weaving in ends tips – I shall try this on my next join for certainly my joining is no where near as tidy as yours! I was young and it being my first sweater the last thing I wanted was an expert in the field scrutinizing it. So I think it was more me than her. Some people are just like that, I guess. I would take her no comment as a positive sign of work well done. I came into knitting from doing a lot of embroidery and cross stitch, both of which require neat wrong sides. So it was just natural to me that the reverse side of the knit would need to look okay. a good base of knowledge to start with! I am fanatical about neat weave ends and backs. My mother cross-stitches and when she taught me, there was also a lesson on the proper, neatest way to weave the ends. Her stitching is pristine on both sides and I envied such technique that I carried it over into my knitting/crocheting because I don’t cross-stitch anymore. I want to meet a famous knitter! I suppose I should get a a fiber festival to do that. Yes, that’s where my neat ends come from: embroidery and cross stitch.